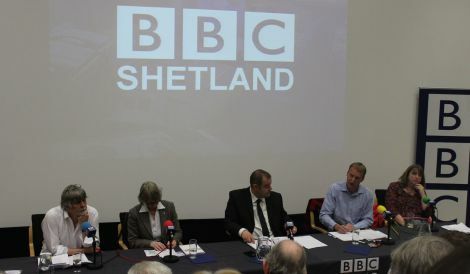 WEDNESDAY night saw two of the biggest events in Shetland ahead of the independence referendum as BBC Radio Shetland hosted their long awaited Yes/No debate and the SNP brought deputy first minister Nicola Sturgeon north to address islanders on her nationwide tour. Pete Bevington attended both events and gives his verdict. It must have been one of the most out of the ordinary evenings of political debate that Shetland has ever witnessed. By strange coincidence BBC Radio Shetland and the SNP had both chosen 27 August as their big night in Lerwick for the final build up to the referendum. The BBC, as you would expect, put together a perfectly-balanced panel – one man and one woman on each side, one MSP for Yes and one for No. Afterwards the SNP rolled in the chief architect of their independence campaign, deputy first minister Nicola Sturgeon who has been unleashed on the streets of Scotland as the debate enters its closing phase ahead of next month’s ballot. The auditorium was packed for both events – standing room only for Sturgeon – but the tenor of the two historic occasions could not have been more different. 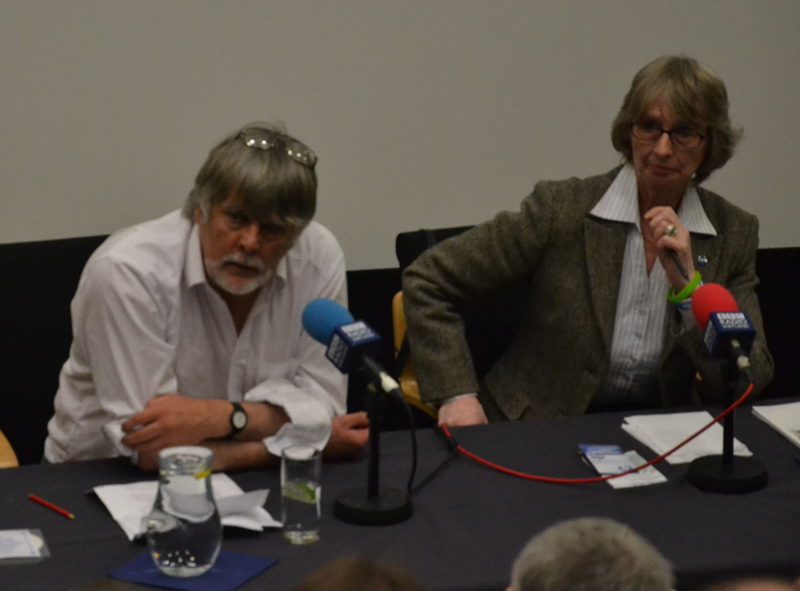 The BBC debate, recorded for broadcast at 6.10pm on Thursday, came across as a rather aggressive and unfriendly affair with both sides bickering over a selection of pre-chosen questions – the future of the NHS, currency, Europe, crofting, fishing and public spending. 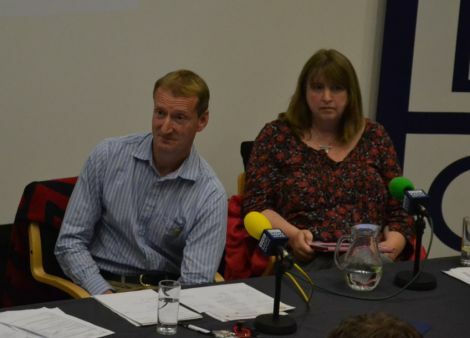 Shetland MSP Tavish Scott, fresh from his marathon Ferry to the Referendum roadshow across the isles, dominated a debate that was long on rhetoric and short on inspiration. 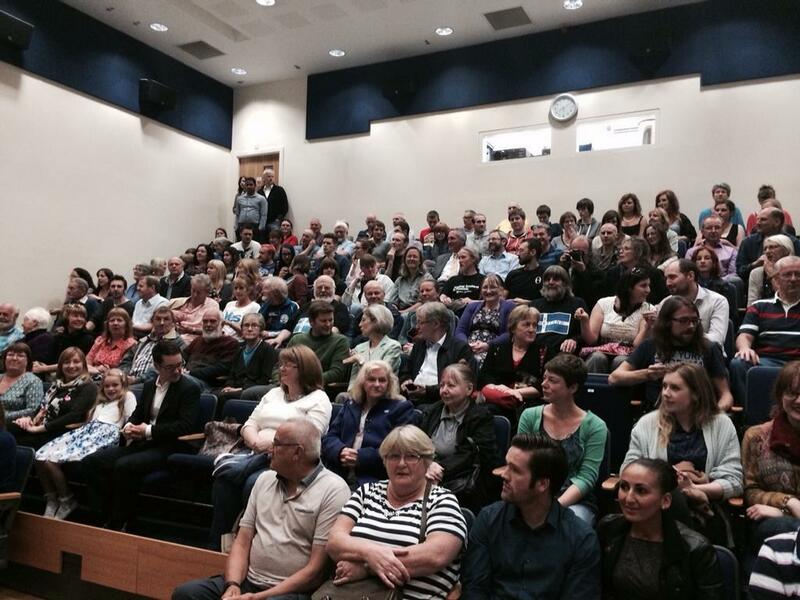 Scott and a squad of Better Together activists in the audience delivered volley after volley against “the nationalists” and their intent on centralising everything in Edinburgh, leaving behind a stream of unanswered questions about the consequences of a Yes vote. His fellow No campaigner, Hillswick GP Susan Bowie, raised serious doubts about the future of the NHS following a Yes vote and complained about the divisive nature of the debate. From the floor, former SIC finance director Graham Johnston was particularly fierce on Better Together’s biggest bugbear, the currency issue. Fish trader Karl Simpson wanted assurances that business would carry on as usual the day after the referendum was over. Shetland Conservative Association chairman Maurice Mullay asked if Scotland’s high public spending would be at risk after independence. Independent list MSP Jean Urquhart and union activist Brian Smith argued hard, but failed to fend off the doubters who dominated the proceedings. Unfortunately the hour long event left a sour taste as the discussion threatened to descend into personal attack with tempers rising. As the doubters filed out of the room after the debate ended, a flood of predominantly young people who had been waiting outside poured in to see Sturgeon, the real star of the SNP’s independence campaign. 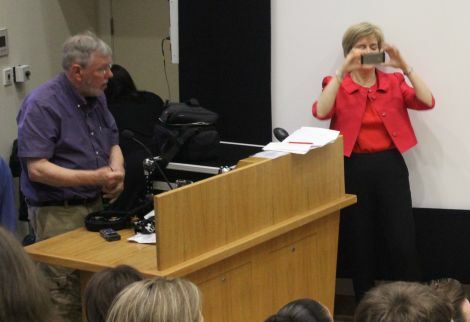 She welcomed everyone, insisting that far from being divisive the debate had enlivened politics throughout Scotland, packing local halls throughout the land. It seemed a real shame the Better Together brigade had left the room as Sturgeon was able to provide many answers to the questions they had. No, she said, we would not be forced into an endless round of negotiation with the rest of the UK and Brussels after a Yes vote, when we would see “an outbreak of common sense” on issues such as currency and Europe. A study of 30 of the 150 countries that had attained independence since World War Two showed terms should be agreed within 15 months. An academic study from the London School of Economics said setting up a new state would cost around £200 million. Unexpectedly, currency did not come up as a concern from an audience who seemed to have broken through the barrier of fear that the prospect of going it alone has engendered since this referendum debate started over two years ago. That said, Sturgeon was perfectly clear and convincing that Scotland had a very strong and legally sound negotiating card when it came to paying its eight per cent share of the UK’s £1.5 trillion debt in exchange for using the pound. Scotland would retain the pound and would remain part of the EU on pretty much the same terms as we enjoy now, she said, once again saying “pragmatism” would win the day. As to the NHS, she was able to articulate very clearly why a No vote would be a threat to the health budget even though the Scottish Parliament controls health policy. Westminster gives Scotland a percentage of its public spending, and as privatisation sweeps through the NHS in England it reduces the public health budget for the whole of the UK, including Scotland if it remains in the Union. She also voiced scepticism about the UK government giving Scotland more powers after a No vote after they rejected putting the Devo Max option on the ballot paper as a second question. “Why be so against having it on the ballot paper if you have any intention at all of delivering that,” she said. 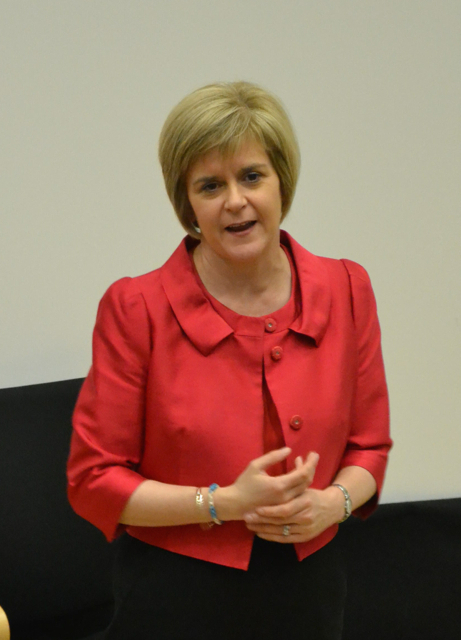 As for the accusation of centralisation, she pledged that an independent Scotland would “empower” local communities, even offering to consider letting the islands join the Scottish negotiating team after a Yes vote. “Voting Yes is the start of a journey, wresting powers out of the hands of politicians hundreds of miles away in London to give them to us to pass on,” she said. She ended the evening with a call to Yes supporters to help the cause. “We are within touching distance,” she claimed, adding the argument would be won on the doorsteps and living rooms of Scotland and not in the press or on TV. The night ended with a standing ovation and rapturous applause from around 150 people, the majority evidently impressed and inspired by her grasp of the arguments and her down to earth, friendly manner. The evening belonged to Sturgeon.